The equipments of that institution are simply superb.... The new laboratory is almost equal to that of University College in London. And up there two miles from the city, hanging onto civilization by the skirts as it were, like a baby to its mother's gown. It is a sort of poem, in the vast volume of prose one goes through to get to it. -English philanthropist and women's rights pioneer Emily Faithfull, April 27, 1883, in the New York Star. The experimental method of teaching physical science begun by Benjamin Silliman, Sr., the first professor of chemistry at Yale University and founding editor of The American Journal of Science, was the model at Vassar from the beginning. Chemistry had been taught along with physics in Room C on the first floor of Main Building, which was very probably, according to Vassar's professor of chemistry, LeRoy C. Cooley, the site of the first laboratory work in the science by an American woman. By 1879, however, an urgent need had developed not only for more space but also for a separate building that would allow the increasing number of Vassar students of chemistry to work in a setting both safe and appropriate for its modern, laboratory-based study. Room C was small, poorly lighted, and not well ventilated. Moreover, the valuable new laboratory equipment was overflowing its space. 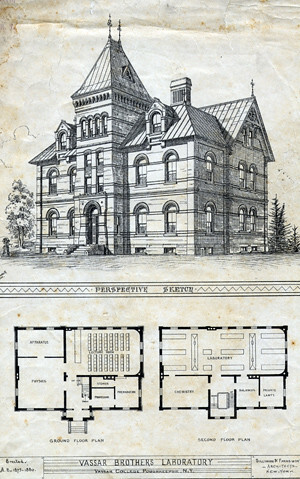 On June 3, 1879, President Samuel Caldwell warmly endorsed Cooley's assessment of the situation to the Executive Committee of the board: the facilities were not large enough for the 176 students in the department of physics and chemistry; the science professors and students could not escape from impure air and noxious gases on Main's first floor; a new and separate building was absolutely required. Caldwell believed that lack of light was one of the worst problems. During two-thirds of the college year, there was no direct sunlight in Room C, and often it was so dark that the gas had to be lit, adding to the risks. Caldwell and the Committee on Repairs and Improvements were directed to study the matter and to "report at an early day," a decision no doubt also influenced by the $300,000 worth of property damage caused by a recent explosion in the chemistry lab at Lafayette College. Later that month, Caldwell devoted over a quarter of his annual report to explaining, in detail, the importance of Cooley's request to keeping Vassar students safe and current with the latest pedagogy. The new building was approved. Cooley was aided in the laboratory's planning by Professor Benjamin Silliman, Jr., who had followed his father both as chemistry professor at Yale and in a research interest, becoming, in the 1850's, the first petroleum geologist in the United States. Silliman, Jr., was in addition a principal, with James M. Farnsworth, in Silliman & Farnsworth, the New York architectural firm commissioned to design Vassar's new building. Within a few years of completing Vassar's building--for which, it is thought, three blueprints brought to Poughkeepsie were among the first blueprints ever made--the firm was to complete two landmark buildings in New York City, the Morse Building (1880) and Temple Court (1881-83). (1) Both buildings exhibit the eclectic Romanesque and Queen Anne design elements present in the Vassar laboratory. Elizabeth Daniels has observed that "No other structure on the campus has ever moved so quickly from the dreams of the desiring faculty to bricks and mortar" as did the new laboratory. Matthew Vassar's nephews pledged the necessary funds and Matthew Vassar, Jr. himself solicited the bids from local builders, plumbers, and outfitters. Masons' bids were in by the end of August 1879, and plumbers' proposals were complete two weeks before Thanksgiving. 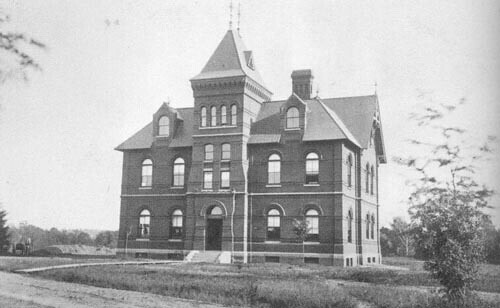 The building was built and supplied with ample equipment for a little over $10,000, and a trustee committee appointed in March 1880 sent out 250 invitations to 'suitable exercises' for the laboratory's opening, on April 16. The laboratory's ground floor was designated for physics, with a room for "apparatus," a lecture room, space for stores and preparation of materials, and an office for the professor. On the second floor were a large chemistry laboratory for students, a private one for the professor, and a room for scales and balances. The day before the building's dedication, the Albany Argus declared it "one of the most convenient, roomy, and perfectly equipped chemistry laboratories in America." Forty-five by sixty-five feet, with three stories of brick and slate, this building was even "more striking than Main Building," which stood about 500 feet away. For the main chemical laboratory good light is secured by its numerous windows looking to the east, the south and the west. Good air is insured by means of flues which furnish ventilation from the ceiling and from the floor, and also by means of . . . . ventilating chambers, easy of access from all parts of the room, providing a quick exit for offensive fumes. Sixty-two working tables are arranged in three groups. Each table is supplied with a set of reagent and specimen bottles: with gas, water, sink, and filter pump. In two of the groups, each table is provided with a double set of drawers and cupboards so that it can accommodate two students working at different periods. Freestanding laboratories had been developed only at places like Yale's Sheffield Scientific School (1852) and the Massachusetts Institute of Technology (1865) and the Stevens Institute of Technology (1870). Thus, Cooley reminded his audience, the facilities that Vassar Brothers Laboratory provided were virtually unknown in science courses in liberal arts curricula. "But," he emphasized, "underneath these technical and university courses there lies the academic course in Arts for general culture, and in this department of our colleges and universities the facilities for the practical study of chemistry and physics are very limited and in most cases altogether unknown." Vassar Brothers Laboratory served the departments of chemistry and physics for many years, until the completion, first, of Sanders Hall of Chemistry in 1909 and, then, of Sanders Hall of Physics in 1926. The building, slated to be torn down in 1925, was saved by its psychologist tenants, who successfully resisted the mandatory move. With their colleagues in economics--and later with the staff of a New York State agricultural experimental station--they stayed in Vassar Brothers Laboratory until 1938, when the building's several delapidations were judged too expensive to correct. Many of the economists and psychologists, having no use for the multidisciplinary subject of euthenics, moved under protest to Blodgett, which had been built expressly for the euthenics program. The Vassar Brothers Laboratory disappeared even more quickly than it had come into being; the demolition, ordered in May, was completed by September. For almost 50 years after its demolition, however, students could tell where the building had stood; the laboratory's doorstep stone, which had been preserved as a bench exactly where the it had been set in 1879, disappeared with the construction in 1984 of the Seeley G. Mudd Chemistry Building. The Morse Building, one of the first "modern" tall office buildings, was commissioned by the nephews of Vassar trustee Samuel F. B. Morse, and Temple Court, an early experiment in environmental design, was notable for providing ample fresh air flow and natural heating, cooling, and—through an atrium—lighting. Daniels, Elizabeth. Main to Mudd and More. Poughkeepsie: Vassar College, 1996. 24-26. Vassar Board of Trustees Executive Committee Minutes, 1878-80, 1935-38. VCSC. Subject file: Vassar Brothers Laboratory. VCSC.